"WHO'S that?" Peter Rabbit pricked up his long ears and stared up at the tops of the trees of the Old Orchard. Instantly Jenny Wren popped her head out of her doorway. She cocked her head on one side to listen, then looked down at Peter, and her sharp little eyes snapped. "I don't hear any strange voice," said she. "The way you are staring, Peter Rabbit, one would think that you had really heard something new and worth while." Just then there were two or three rather sharp, squeaky notes from the top of one of the trees. "There!" cried Peter. "There! Didn't you hear that, Jenny Wren?" "For goodness' sake, Peter Rabbit, you don't mean to say you don't know whose voice that is," she cried. "That's Rosebreast. He and Mrs. Rosebreast have been here for quite a little while. I didn't suppose there was any one who didn't know those sharp, squeaky voices. They rather get on my nerves. What anybody wants to squeak like that for when they can sing as Rosebreast can, is more than I can understand." At that very instant Mr. Wren began to scold as only he and Jenny can. Peter looked up at Jenny and winked slyly. "And what anybody wants to scold like that for when they can sing as Mr. Wren can, is too much for me," retorted Peter. "But you haven't told me who Rosebreast is." "The Grosbeak, of course, stupid," sputtered Jenny. "If you don't know Rosebreast the Grosbeak, Peter Rabbit, you certainly must have been blind and deaf ever since you were born. Listen to that! Just listen to that song!" Peter listened. There were many songs, for it was a very beautiful morning and all the singers of the Old Orchard were pouring out the joy that was within them. One song was a little louder and clearer than the others because it came from a tree very close at hand, the very tree from which those squeaky notes had come just a few minutes before. Peter suspected that that must be the song Jenny Wren meant. He looked puzzled. He was puzzled. "Do you mean Welcome Robin's song?" he asked rather sheepishly, for he had a feeling that he would be the victim of Jenny Wren's sharp tongue. "No, I don't mean Welcome Robin's song," snapped Jenny. "What good are a pair of long ears if they can't tell one song from another? That song may sound something like Welcome Robin's, but if your ears were good for anything at all you'd know right away that that isn't Welcome Robin singing. That's a better song than Welcome Robin's. Welcome Robin's song is one of good cheer, but this one is of pure happiness. I wouldn't have a pair of ears like yours for anything in the world, Peter Rabbit." Peter laughed right out as he tried to picture to himself Jenny Wren with a pair of long ears like his. "What are you laughing at?" demanded Jenny crossly. "Don't you dare laugh at me! If there is any one thing I can't stand it is being laughed at." "I wasn't laughing at you," replied Peter very meekly. "I was just laughing, at the thought of how funny you would look with a pair of long ears like mine. Now you speak of it, Jenny, that song is quite different from Welcome Robin's." "Of course it is," retorted Jenny. "That is Rosebreast singing up there, and there he is right in the top of that tree. Isn't he handsome?" Peter looked up to see a bird a little smaller than Welcome Robin. His head, throat and back were black. His wings were black with patches of white on them. But it was his breast that made Peter catch his breath with a little gasp of admiration, for that breast was a beautiful rose-red. The rest of him underneath was white. It was Rosebreast the Grosbeak. He is all red save his black wings and tail. You cannot mistake this black and white bird with the rose-colored breast for any one else. It is the Rose-breasted Grosbeak. "Isn't he lovely!"' cried Peter, and added in the next breath, "Who is that with him?" "Mrs. Grosbeak, of course. Who else would it be?" sputtered Jenny rather crossly, for she was still a little put out because she had been laughed at. "I would never have guessed it," said Peter. "She doesn't look the least bit like him." This was quite true. There was no beautiful rose color about Mrs. Grosbeak. She was dressed chiefly in brown and grayish colors with a little buff here and there and with dark streaks on her breast. Over each eye was a whitish line. Altogether she looked more as if she might be a big member of the Sparrow family than the wife of handsome Rosebreast. 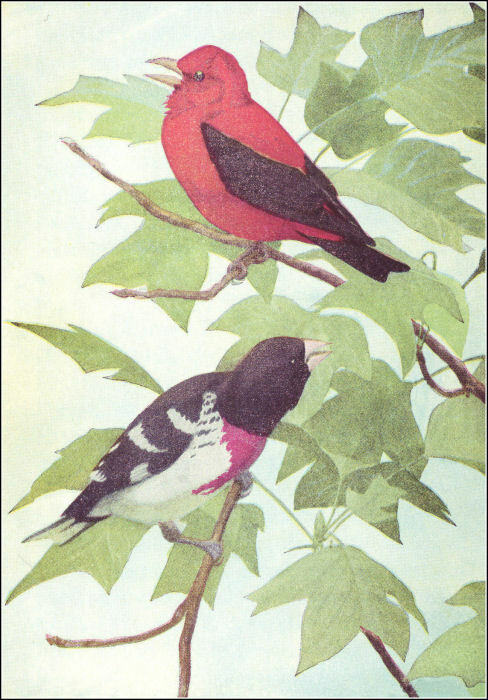 While Rosebreast sang, Mrs. Grosbeak was very busily picking buds and blossoms from the tree. "What is she doing that for?" inquired Peter. "For the same reason that you bite off sweet clover blossoms and leaves," replied Jenny Wren tartly. "Do you mean to say that they live on buds and blossoms?" cried Peter. "I never heard of such a thing." "Tut, tut, tut, tut, tut! You can ask more silly questions than anybody of my acquaintance," retorted Jenny Wren. "Of course they don't live on buds and blossoms. If they did they would soon starve to death, for buds and blossoms don't last long. They eat a few just for variety, but they live mostly on bugs and insects. You ask Farmer Brown's boy who helps him most in his potato patch, and he'll tell you it's the Grosbeaks. They certainly do love potato bugs. They eat some fruit, but on the whole they are about as useful around a garden as any one I know. Now run along, Peter Rabbit, and don't bother me any more. Seeing Farmer Brown's boy coming through the Old Orchard Peter decided that it was high time for him to depart. So he scampered for the Green Forest, lipperty-lipperty-lip. Just within the edge of the Green Forest he caught sight of something which for the time being put all thought of Farmer Brown's boy out of his head. Fluttering on the ground was a bird than whom not even Glory the Cardinal was more beautiful. It was about the size of Redwing the Blackbird. Wings and tail were pure black and all the rest was a beautiful scarlet. It was Redcoat the Tanager. At first Peter had eyes only for the wonderful beauty of Redcoat. Never before had he seen Redcoat so close at hand. Then quite suddenly it came over Peter that something was wrong with Redcoat, and he hurried forward to see what the trouble might be. Redcoat heard the rustle of Peter's feet among the dry leaves and at once began to flap and flutter in an effort to fly away, but he could not get off the ground. "What is it, Redcoat? Has something happened to you? It is just Peter Rabbit. You don't have anything to fear from me," cried Peter. The look of terror which had been in the eyes of Redcoat died out, and he stopped fluttering and simply lay panting. "Oh, Peter," he gasped, "you don't know how glad I am that it is only you. I've had a terrible accident, and I don't know what I am to do. I can't fly, and if I have to stay on the ground some enemy will be sure to get me. What shall I do, Peter? What shall I do?" Right away Peter was full of sympathy. "What kind of an accident was it, Redcoat, and how did it happen?" he asked. "Broadwing the Hawk tried to catch me," sobbed Redcoat. "In dodging him among the trees I was heedless for a moment and did not see just where I was going. I struck a sharp-pointed dead twig and drove it right through my right wing." Redcoat held up his right wing and sure enough there was a little stick projecting from both sides close up to the shoulder. The wing was bleeding a little. "Oh, dear, whatever shall I do, Peter Rabbit? Whatever shall I do?" sobbed Redcoat. "Does it pain you dreadfully?" asked Peter. Redcoat nodded. "But I don't mind the pain," he hastened to say. "It is the thought of what MAY happen to me." Meanwhile Mrs. Tanager was flying about in the tree tops near at hand and calling anxiously. She was dressed almost wholly in light olive-green and greenish-yellow. She looked no more like beautiful Redcoat than did Mrs. Grosbeak like Rosebreast. "Can't you fly up just a little way so as to get off the ground?" she cried anxiously. "Isn't it dreadful, Peter Rabbit, to have such an accident? We've just got our nest half built, and I don't know what I shall do if anything happens to Redcoat. Oh, dear, here comes somebody! Hide, Redcoat! Hide!" Mrs. Tanager flew off a short distance to one side and began to cry as if in the greatest distress. Peter knew instantly that she was crying to get the attention of whoever was coming. Poor Redcoat, with the old look of terror in his eyes, fluttered along, trying to find something under which to hide. But there was nothing under which he could crawl, and there was no hiding that wonderful red coat. Peter heard the sound of heavy footsteps, and looking back, saw that Farmer Brown's boy was coming. "Don't be afraid, Redcoat," he whispered. "It's Farmer Brown's boy and I'm sure he won't hurt you. Perhaps he can help you." Then Peter scampered off for a short distance and sat up to watch what would happen. Of coarse Farmer Brown's boy saw Redcoat. No one with any eyes at all could have helped seeing him, because of that wonderful scarlet coat. He saw, too, by the way Redcoat was acting, that he was in great trouble. As Farmer Brown's boy drew near and Redcoat saw that he was discovered, he tried his hardest to flutter away. Farmer Brown's boy understood instantly that something was wrong with one wing, and running forward, he caught Redcoat. "You poor little thing. You poor, beautiful little creature," said Farmer Brown's boy softly as he saw the cruel twig sticking through Redcoats' shoulder. "We'll have to get that out right away," continued Farmer Brown's boy, stroking Redcoat ever so gently. Somehow at that gentle touch Redcoat lost much of his fear, and a little hope sprang in his heart. This was no enemy, but a friend. Farmer Brown's boy took out his knife and carefully cut off the twig on the upper side of the wing. Then, doing his best to be careful and to hurt as little as possible, he worked the other part of the twig out from the under side. Carefully he examined the wing to see if any bones were broken. None were, and after holding Redcoat a few minutes he carefully set him up in a tree and withdrew a short distance. Redcoat hopped from branch to branch until he was halfway up the tree. Then he sat there for some time as if fearful of trying that injured wing. Meanwhile Mrs. Tanager came and fussed about him and talked to him and coaxed him and made as much of him as if he were a baby. Peter remained right where he was until at last he saw Redcoat spread his black wings and fly to another tree. From tree to tree he flew, resting a bit in each until he and Mrs. Tanager disappeared in the Green Forest. "I knew Farmer Brown's boy would help him, and I'm so glad he found him," cried Peter happily and started for the dear Old Briar-patch.